U.S. Army To Scrap $7 Billion In Equipment In Afghanistan : The Two-Way Military planners for the U.S. Army have decided not to ship back more than $7 billion of equipment — about 20 percent of what the Army brought into Afghanistan. Much of the equipment is being dismantled and sold to the scrap market there — one of the largest military retrogrades in history. Mine-resistant, ambush-protected vehicles — MRAPs — like these are some of the more than $7 billion in equipment the U.S. Army is dismantling and selling as scrap in Afghanistan. In preparation for a complete exit from Afghanistan by the end of 2014, the U.S. military has destroyed more than 170 million pounds' worth of military equipment, The Washington Post reported. Military planners for the U.S. Army have decided not to ship back more than $7 billion of equipment — about 20 percent of what the Army brought into Afghanistan — because the shipping costs are too high and the need for the used equipment too low. Instead, the Army is destroying the equipment in-country: shredding it, crushing it and selling it on the Afghan scrap market. 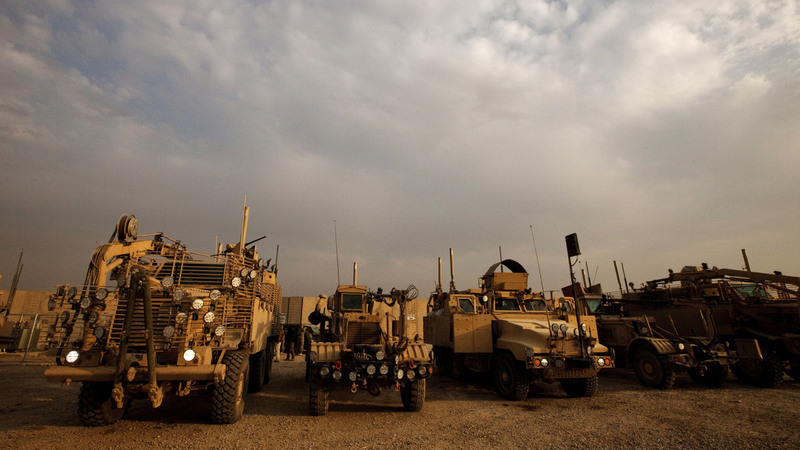 The equipment destruction is likely to raise questions in both the U.S. and Afghanistan about military planning and whether the U.S. Army should be finding ways for its vehicles and machinery to get reused. Shipping the equipment back to the U.S. or to other allied nations seems too costly, and donating it to the Afghans is complicated owing to thorny rules surrounding giving equipment to other countries, the Post reported. As such, Army officials have opted to destroy it. Much of the equipment being destroyed comes in the form of mine-resistant, ambush-protected vehicles, or MRAPs, hulking vehicles built to counter the threat of roadside bombs. MRAPs cost approximately $1 million each, and the Army has labeled about 2,000 of the 11,000 MRAPs in Afghanistan "excess." The remaining 9,000 will be shipped out of the country for use elsewhere. Those excess MRAPs are in the process of being dismantled at scrap yards at the four U.S. military bases in Afghanistan. The machines are resilient and were built to withstand explosions, so breaking down each MRAP requires about 12 hours of work with special blowtorches. Part of the reason for destroying the equipment in-country rather than transporting it elsewhere — as the Army did when withdrawing from Iraq — has to do with the fact that the geography of Afghanistan presents unique challenges for retrograde, or removing military equipment from foreign war zones. "Afghanistan is landlocked, so everything moving in and out must go by air," says U.S. Army spokesman Wayne Hall. "This provides challenges for us to get the equipment out." Maj. Gen. Kurt J. Stein, head of the 1st Sustainment Command, who is overseeing the drawdown in Afghanistan, told the Post that leaving Afghanistan requires the largest retrograde mission in history.